Content Marketing Strategy - The Who, What, and Why. Our Blog on All Things Marketing Related. Content Marketing Strategy – Why? In the words of Bill Gates, “Content is king.” Whether you still believe in that or not is completely subjective, but let us explain why we think it is indeed reigning. Creating a content marketing strategy was originally intended to spread information, and it still is to this day. But, content and a content marketing strategy have evolved into something larger and more impactful than just the spread of information. Content marketing strategies need to be implemented by every single organization that partakes on the internet. Otherwise, your business will lag behind your competitors, and you will ultimately be left behind. Content Marketing Strategy – What? Can you create a content marketing strategy yourself, if not, who do you go to? The answer is yes; you can create your content. Even though we offer content marketing, we firmly believe that the best content comes from professionals that are experts in their field. It makes sense, and they will have the most accurate and up-to-date information. The information is also delivered in a natural tone. However, creating content is time-consuming. You need to write compelling copy, keyword analysis, adding imagery, and then publishing your content. The first step to creating a content marketing strategy is figuring out what your audience is interested in reading and sharing. Poll your audience, interview readers, see what your competitor’s content strategy focuses on. Some areas to write about are How To articles, Case Studies, or Reviews. Now that you’ve got your topic of discussion, you need to nail your headline. Your headline will be magnetic for your readers, drawing them into your website and converting them to more readers, more clicks, more leads. 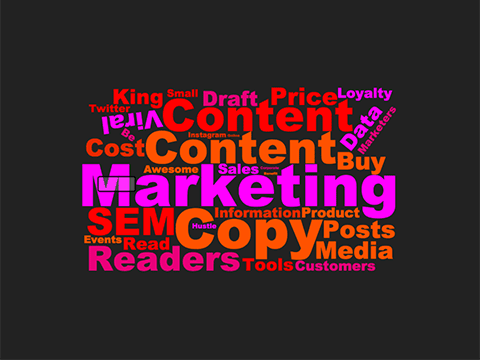 Here is a funky blog title generator for your content marketing. Ok, headline check, what’s next? Writing the original copy. Whether you are a natural or a struggling writer, take a breather, a walk or lay down in a deprivation tank. Starting with a clear head will set your mind free. Sit back down and fire up the Google Keyword Tool. Figure out the keywords you want to rank for. Choose keywords that are relevant but attainable. Draft your content plan around your ideas, packing your pages with relevant keywords. Be sure not to overstuff your post with keywords, that’s a big no-no. Don’t just tell your audience, show them. Infographics and imagery are influential and can lead to sharing on social platforms. Here is a sweet little website for creating free infographics for your content marketing strategy. So there is your what. Feeling out of touch with the internet? Or perhaps you have zero time or resources to create your content marketing strategy. There are a variety of services that offer content marketing services. Be wary of people on websites like Fivvr, where you get what you pay for. At Creative Revolution, we understand small business owners are operating on limited time and resources. Save time and resources and have us write your original content marketing strategy. Bam, there is your who. I am the one who likes cupcakes.